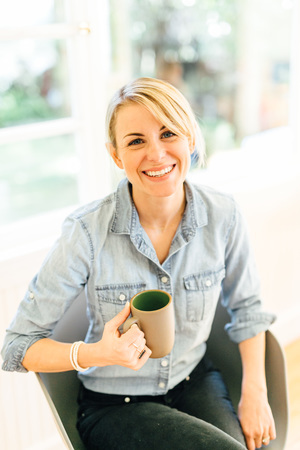 We hit the snooze button, we stumble out of bed, we make our way cold and bleary-eyed to the kitchen where we immediately pour a bowl of cereal, heat up some oatmeal or slather some toast with peanut butter. This apricot vanilla breakfast porridge is a delicious blend of four grains: red quinoa, pearl barley, steel cut oats and oat bran, and will get you out of your boring oatmeal rut and into something a little more… colorful, shall I say? If you’re already thinking there’s no WAY I have time to make this weird grainy breakfast porridge on weekday morning, you’re wrong! I’ve always been a big fan of make-ahead breakfasts and this is no excuse. Just simmer the grains together for half an hour on Sunday evenings and then all you have to do during the week is a quick thirty second reheat. It really doesn’t get simpler than that. I love to keep a big tupperware container full of this all week long in the fridge–it makes breakfasts super speedy and delicious! 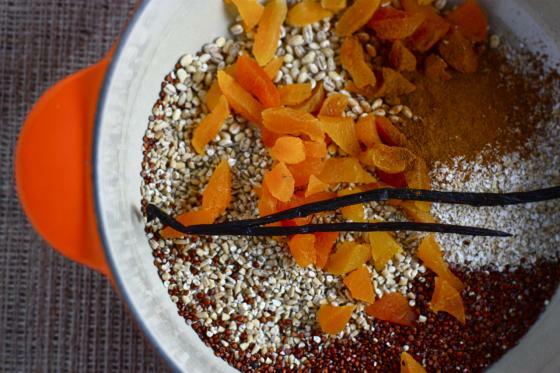 The grains are simmered with chopped dried apricots, cinnamon and a vanilla bean. You could also swap the apricot for dried cranberries or cherries if you prefer, but I just love how the apricot chunks get all soft and chewy after cooking. It makes me wish I enjoyed them fresh as much as I enjoy them dried. I like to top my bowl with a little milk, chopped walnuts, pure maple syrup and fresh berries. Almond butter and sliced banana would be great, too! So….what are you waiting for? Get thee in the kitchen tonight and boil some grains! Your belly will be thankful you did when the alarm goes off tomorrow. And maybe, just maybe, you’ll hit the snooze button one less time. Combine all ingredients in a large pot and bring to a boil. Reduce heat to simmer, cover, and let cook for about thirty minutes or until very thick. Remove from heat and serve warm with additional toppings (nuts, berries, bananas, milk, brown sugar, maple syrup) or keep in a large covered tupperware container in the fridge for quick weekday breakfasts. I’ll take a side of bacon, please. And some cake! I have tried quinoa at breakfast before and have never really liked it (thought I love it for dinner). But, I really like the idea of mixing it in with the other grains. I’m also going to experiment with making granola with it. Hi Christie, just in case you haven’t already tried it, you might enjoy quinnoa and amaranth in flakes. I find adding about one third quinnoa flakes to two thirds rolled oats, and then probably with a few other things thrown in, like fruit, seeds, wheatgerm, or sweet stuff, I can hardly tell the difference. This four grain thing looks really EXITING though 🙂 you deffinately would know your quinnoa was there, hehe. although i don’t think i’d hit the snooze button one less time (old college habits die hard!) i can definitely see myself stumbling downstairs first thing for a bowl of this! Love that there is quinoa in here! I have been eating quinoa for breakfast in lieu of oats and I love it! Just this morning I was thinking about how I could prepare quinoa for breakfast for tomorrow. Then BAM! Jenna shows up with an awesome recipe. Can you read my mind? This looks like a great way to switch up my usual oatmeal breakfasts. I’ve had quinoa sitting in my cupboard for a while and just couldn’t decide what to do with it. I’m definitely making this, with a big scoop of almond butter on top! I never thought about chopping up apricots – that’s a good idea. Vanilla bean? Where do you even get that?! I just started eating quinoa for dinner, let alone breakfast! We’ll have to see. I’ve been thinking about throwing an egg on top! 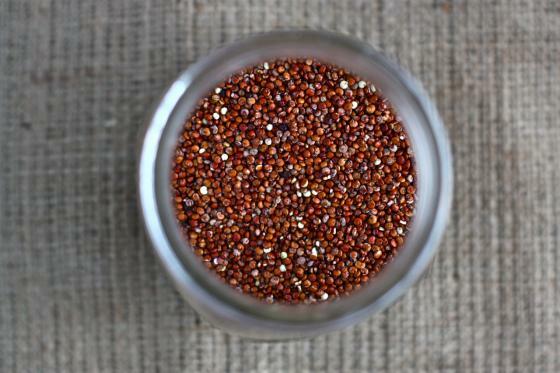 That red quinoa is gorgeous! And yep… if it’s a reheat, I can do it. That actually would SAVE me time in the morning — not add to it! OH man-I just want my kitchen to smell as delicious as I imagine your recipe does! Ahh – this sounds so good, and I have all this stuff in my kitchen right now. Fate? Mmm this porridge looks delicious!! I love that it has so many different grains. I have oatmeal almost every morning, but it could definitely stand some spicing up! Yum! Love the addition of the vanilla bean. Well…. (cough cough) actually a reader from Madagascar send me about 50 fresh vanilla beans (cough cough) so that’s what I’ve been using. I totally hear you on the $$ part and for most recipes you can just sub 2 tsp vanilla extract for them! I have always loved the idea of making breakfasts ahead of time and just reheating, but I never do it! And I have been having smoothies for breakfast even though it is super cold here in MN — I like them year round! It’s much easier to cook when you throw it in with other grains! No risk of burning! I LOVE quinoa for breakfast, especially mixed in oatmeal. This sounds divine!!! My roomate just made fun of me for eating the same breakfast every morning. YAY for trying something new! This looks so good. I always think of Goldilocks and the Three Bears when I think of porridge! But this looks amazing!! I need to try it! Oooh this looks good, and so healthy! I try to soak my grains overnight, which also cuts down on cooking time. yum. I love this mix of grains. Looks delicious! SOmetimes I Just need that extra motivation to prepare breakfast ahead of time. In actuality it saves a ton of time! looks like a great breakfast option! I’ve been wanting to try steel cut oats in the crockpot, but haven’t bought any yet. This looks like a similar idea, except cook ahead. I like the idea of just heating it up in the morning. I haven’t tried quinoa for breakfast. That dish looks like it will keep you going for hours! The combination of vanilla and apricots sounds great. You could just as easily make this in a rice cooker! Then you really have no excuse not to make it in advance. I think I was “blurry-eyed” when I wrote this post. Oops. That looks amazing!! Reminds me that I need to cook some grains for the week. A bit late, but better late than never! Anything with dried apricots is a-ok with me – I am oBsessed with them! I’ve been an unstoppable local bacon for breakfast eating machine lately. I can’t get enough of it! recently i was talking about cornmeal porridge on my blog, but here’s another option i’d never consider! yum! 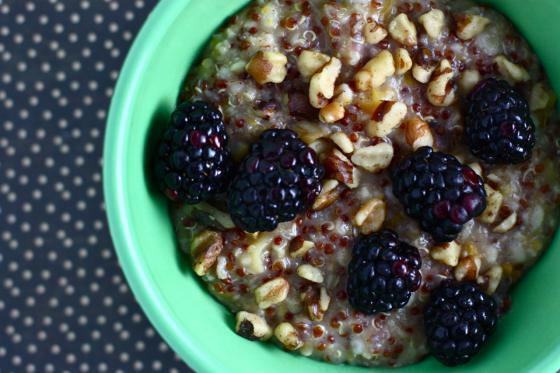 …maybe this can hoist me outta my oatmeal n eggs rut…I love the quinoa idea! Your photography is particularly lovely here! I love the idea of making this in advance, no clue why I never think to do that! All your tasty looking recipes may tempt me into actually *gasp* cooking something. Darn you and your deliciousness!! i love dried apricots lately, i’ve been enjoying them with bits of dark chocolate as a snack with my tea each night. I love the idea of the dried apricots. 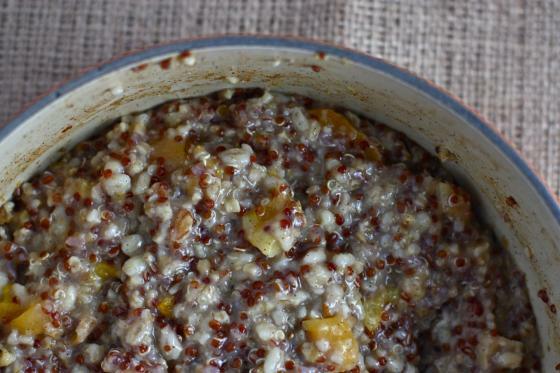 I love eating quinoa for breakfast…a little lighter than oats but still very filling! Hey I also put dried apricots in my brekky this morn. chopped dryroasted almonds and slivers of dried apricots. The apricots were even tastier than the chopped dates I put in yesterday morn. wow! this is a perfect breakfast to me. Great idea!!! 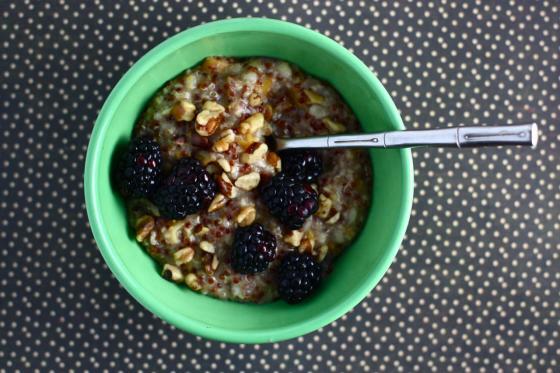 Looks delicious and with school back in full swing for me, I need something make-ahead and speedy… question, though – steel cut oats are soooooo stinking expensive… is there any way I can get away with old fashioned oats instead?? Holy yum! Now you’re talking! This “almost” makes me want to get up in the morning…almost 😉 I know I’ll at least cut down on how many times I hit the snooze button! LOVE quinoa for breakfast. And I happen to have a leftover vanilla bean waiting for this recipe!! 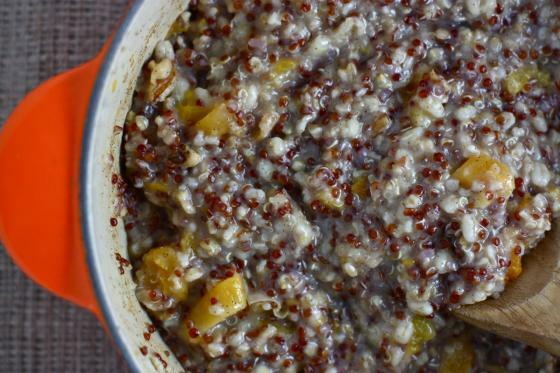 I get bored with oatmeal, so quinoa is a great idea! No smoothies in the winter? I couldn’t imagine such a travesty! Where does one find red quiona? 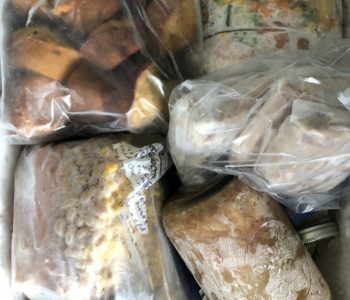 I’ve searched the WF in the south bay (supposed to be one of the largest here) and have yet to find it in the bulk section. Or should I be looking for a box? Or it could be that my eyesight is just getting worse. 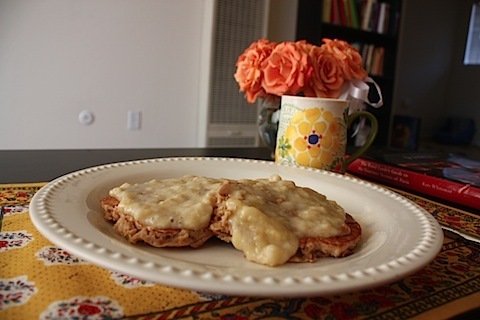 I am loving on this recipe! As I was staring at my hum-drum oatmeal bowl this morning, I thought I needed something new. Then along came this post! Looks delish. I’ve been on the smoothie route lately, but have been wanting to mix it up! I’m going to make a batch of this and see how it turns out! I love that you can just reheat it and you are ready to go! Perfect!!! I have all the ingrediants , but my steel cut oats are quick-cooking. Do you think that would be ok? Thanks for this great breakfast idea!! yep! That would be fine; you might need to reduce cooking time a little bit (15-20 minutes) but it should work! I’m definitely going to try this on the weekend. On an oat related matter did I imagine it or not so long ago did you mention pumkpin oats? because come Sunday I am going to have half a can of pumpkin left over and I like the idea of pumkpin oats but I’m not sure how to create oaty goodness with it. Your oat wisdom would be gratefully received! hehe I don’t think I’ve mentioned pumpkin oats in awhile! I do love them though! especially in the fall. Love, love, love this idea! I have been back-sliding on my healthy breakfasts lately simply because I don’t have a lot of time in the morning before work (toddler gets fed and cleaned up first). I think this is going to be a great recipe to set me straight. Thanks for sharing! Mmmm, thanks for the awesome breakfast recipe. I need to do something other than oatmeal to shake things up a bit. grr. why doesn’t publix have oat bran and pearl barley? or why can’t i find them there? this looks so good. this is what i want for breakfast tomorrow. 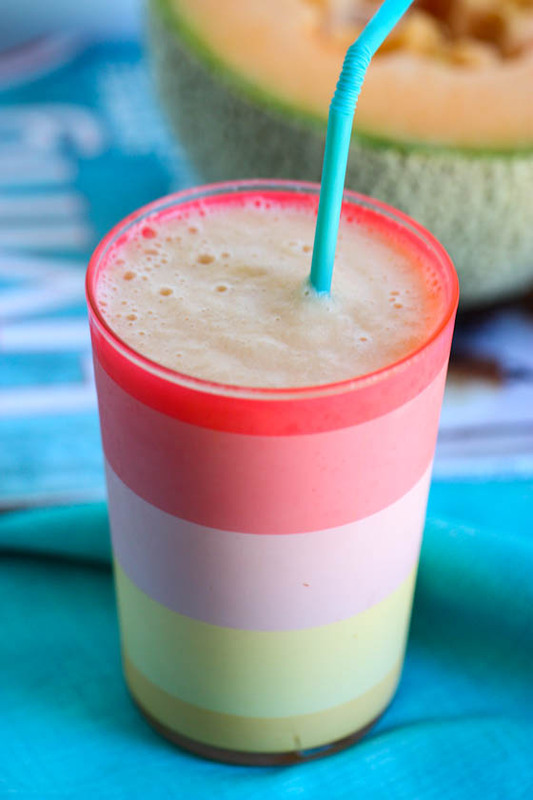 This looks incredibly yummy and I love the colors and texture! Bummer I live in a dorm. This looks so delicious. I love the combo of vanilla and apricots. I am simmering this now, and it smells delicious! Even though it’s very hot here today, I couldn’t resist making it. For all of you that ask, vanilla bean paste works just as well (well, almost…vanilla beans are obviously the best!). It’s expensive, but a small jar can last awhile if you’re not a vanilla freak like me, and it’s miles above vanilla extract. You can usually find it near the vanilla extract. Delish! Just bought all the ingredients and quadrupled the recipe for me and my boyfriend. Stuck it all in a crockpot! Any idea on the serving size and calorie count? Spent a couple of days assembling the ingredients, then made a batch of these last night. Copied your toppings exactly. Brilliant. Very enjoyable and kept me satisfied all morning. Thanks! I made this this morning. It was awesome. I didn’t have any apricots, so I subbed in dried orange-cranberries from Trader Joe’s. I mixed in a spoonfull of Justin’s Maple Almond Butter and cut up a banana on top. It was AWESOME. Thanks for this!! And if you haven’t had Justin’s Nut Butter, you haven’t lived!